I promise nursery pictures are coming soon! But first I wanted to share my last DIY project for our little girls room. I'll admit I wrapped this up a few weeks ago, but I just finally got around to getting this post together! But I am determined to get all of my nursery posts up before she gets here, and well that could really be any day now! Though I'm thinking we are looking at the later versus the sooner, but we'll see, you never know. 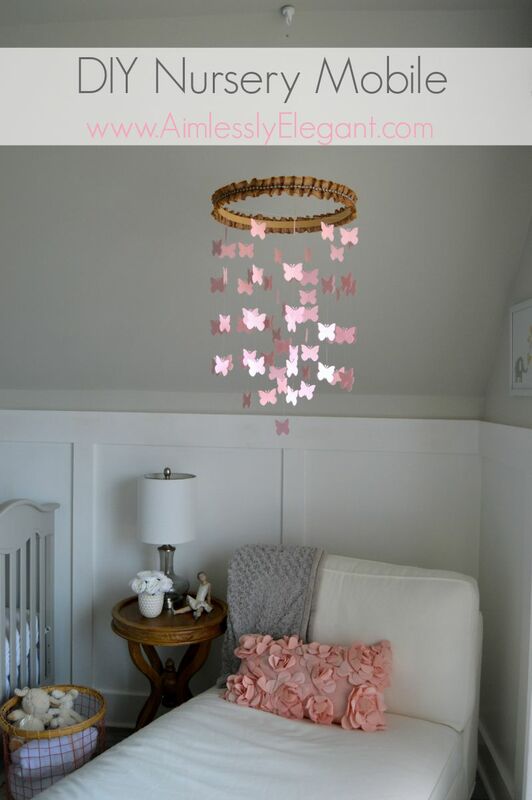 I knew I wanted to incorporate a mobile into the nursery, but I knew with our slopped ceilings it may prevent a little bit of a challenge. 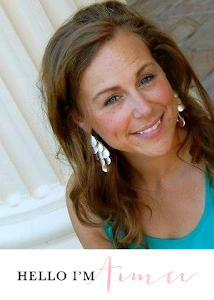 I gathered some inspiration from Pottery Barn Kids and Pinterest and got to work. This project was super easy and probably came together in just a few hours, minus actually hanging it in the room, which I left to Martin. I picked up most all of the supplies needed for this mobile at Hobby Lobby. Start by punching out all your little pieces. 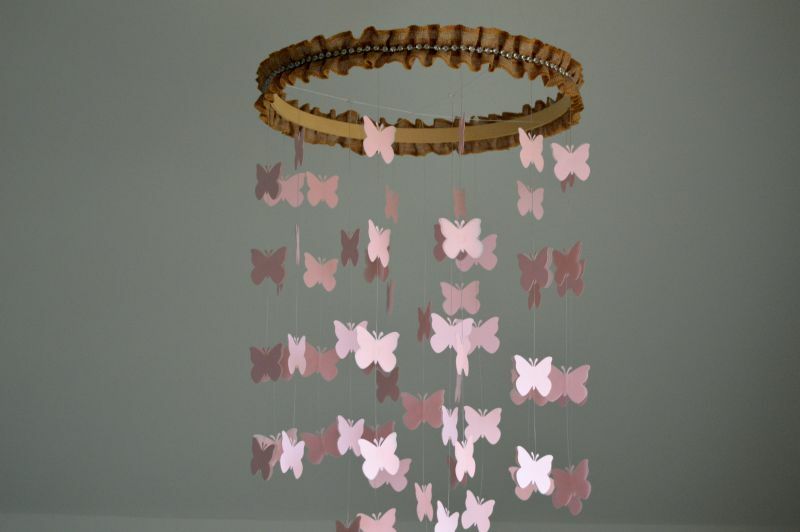 Because of the size of my mobile I decided to go with 17 strands, 4 butterflies on each so I needed 68 butterflies punched from each type of paper. 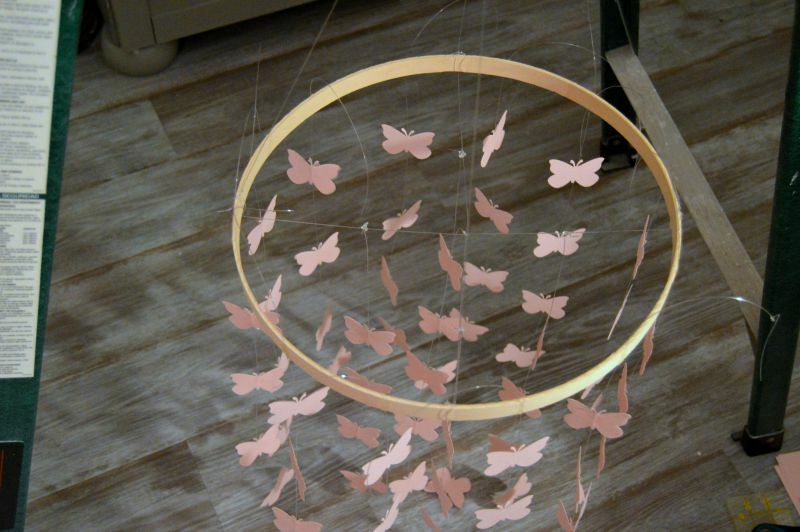 Once I had all my butterflies punched out, I cut my strands of fishing wire they would be hanging from. I made my lines about 20'', but that is all dependent on how long you are going for. Then it was time to assemble each strand. 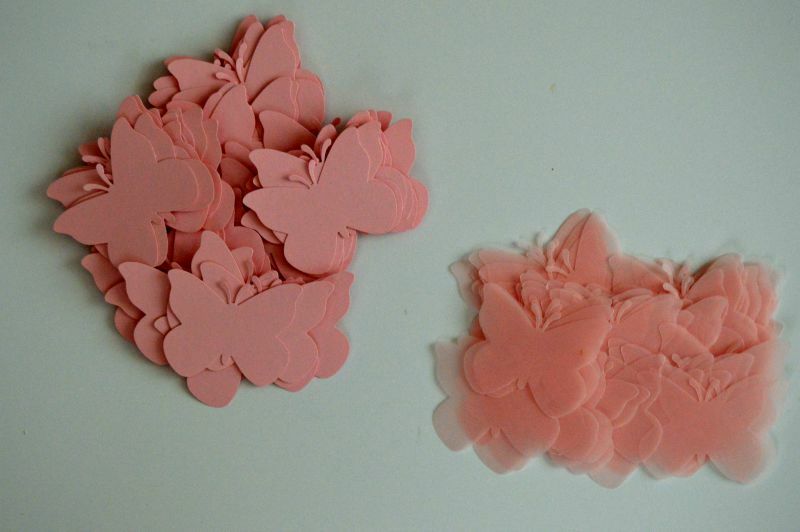 Starting at the bottom of each strand, I spaced the butterflies out about every 4 inches or so. I used my first one as the template and just eyeballed the rest from there. 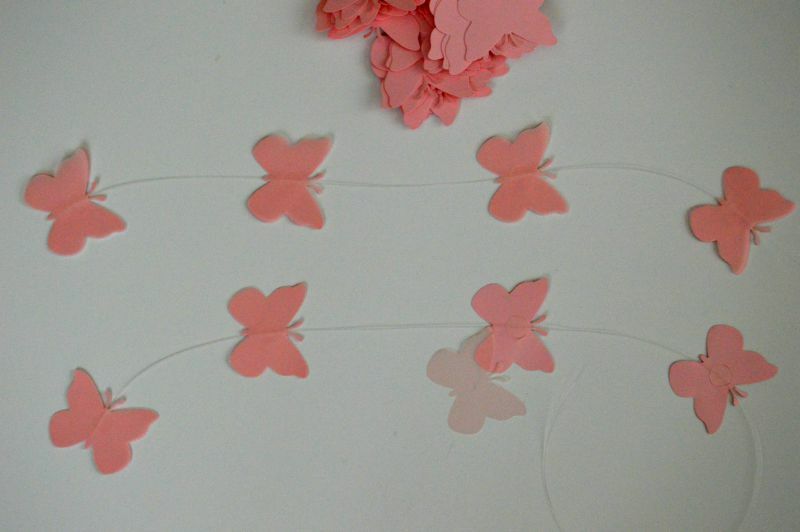 I started with a card stock butterfly on the bottom, put a glue dot in the center, ran my fishing line through the glue dot, and then sandwiched it with a vellum butterfly on top. Though I had 17 strands the assembly went rather quickly. Then it's time to piece everything together, this was probably the most challenging part of the whole thing. 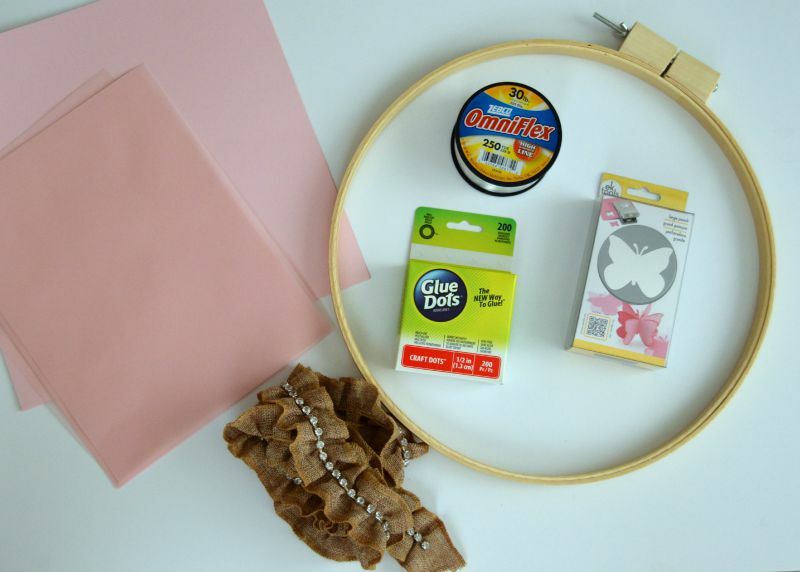 You will only need the inner ring of the embroidery hoop. Using your fishing line create a cross on the hoop. Where the fishing line attaches to the hoop tie attached another piece of fishing line to create the top which you will use to hang it from the ceiling. I kept these pieces really long since I had no idea at this point exactly what I needed, and it's always easier to go back and trim. 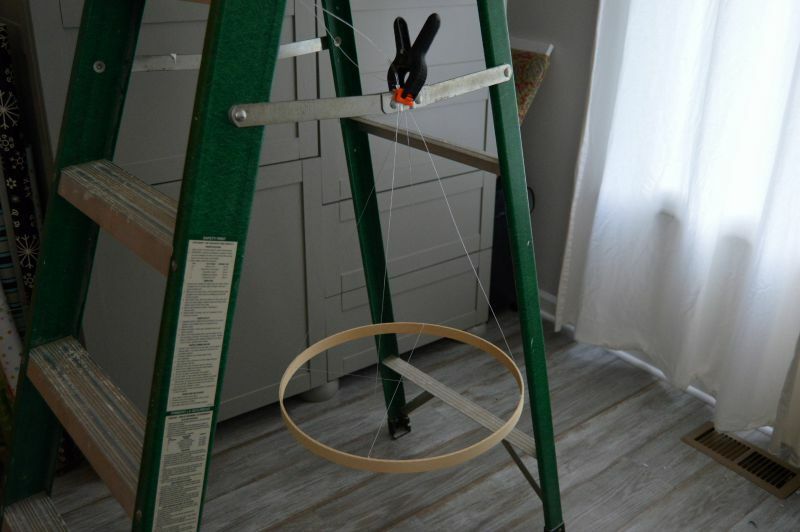 I used a ladder and a clamp to suspend my prepared hoop to make assembly easier. I started with attached my first string to the center of the cross, and I made this one the longest. From there I attached 4 more strings on the midway point of each supporting string, half way between the center and the hoop. These I attached slightly shorter then the center piece. Finally I attached the remaining 12 strands around the outside of the hoop, 3 per quarter. These strands I made the shortest. I first attempted to knot the fishing line, but it just wasn't cutting it, everything was sliding around. So I ended up securing everything with a drop of hot glue, and that worked perfectly. I was a little nervous it was going to melt the fishing line, but I did a test run and the line survived. Once all the strands were strung I simply used my hot glue gun to attach the trim I had found at Hobby Lobby around the top of my hoop, and assembly was complete! 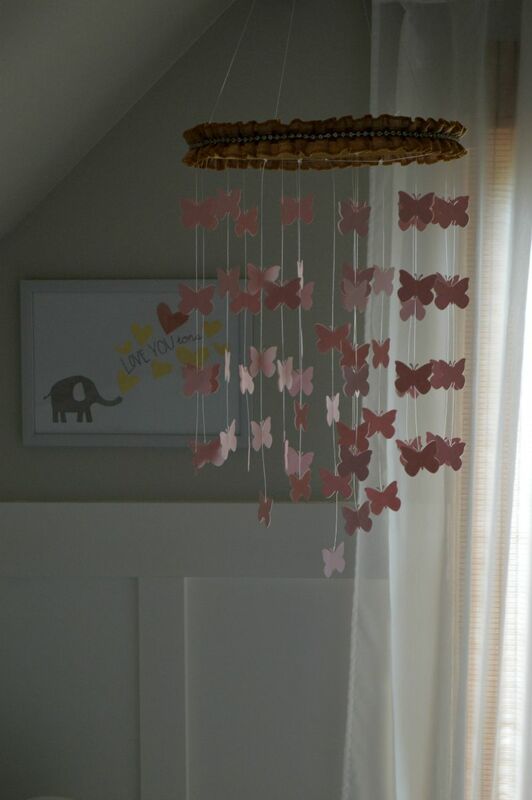 I love that it was so easy and allowed my to incorporate a mobile into the nursery. We decided to hang it above the chair in the nursery so hopefully she will be able to look up at it when we sit there together. Stay tuned for the rest of the nursery soon!